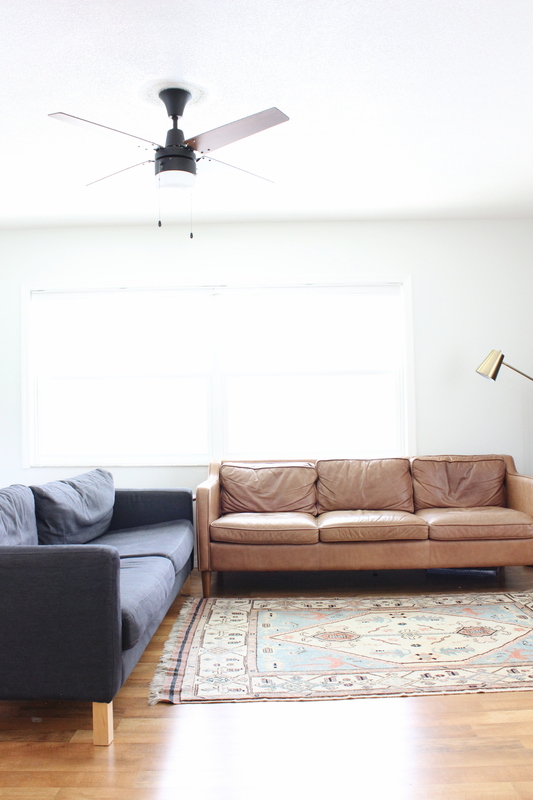 Our living room has undergone some changes since the last time I showed you and even since these photos it has gone through some more. 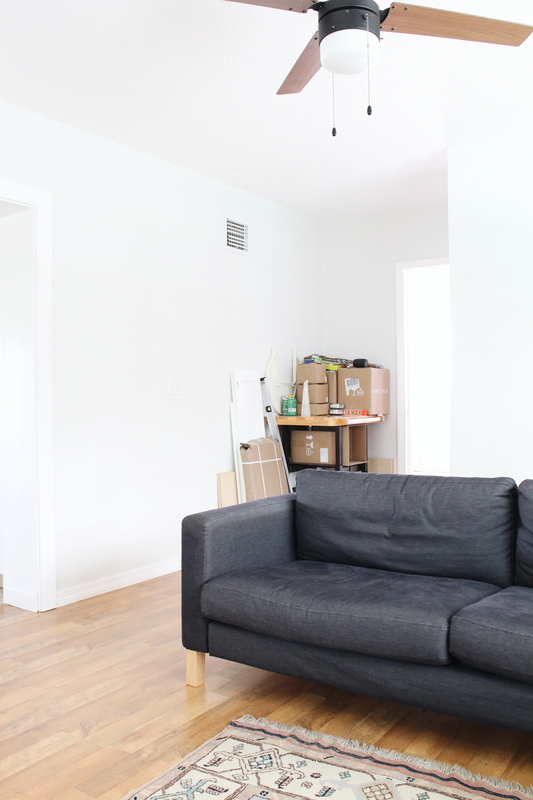 In this post, I’m going to walk you through those changes, the current state, and some short-term goals for the living room. I took these photos as a second thought one afternoon and didn’t bother much with styling. I removed some clutter but didn’t think to fluff the pillows or fix the floor lamp. Way to go, Kimberly. 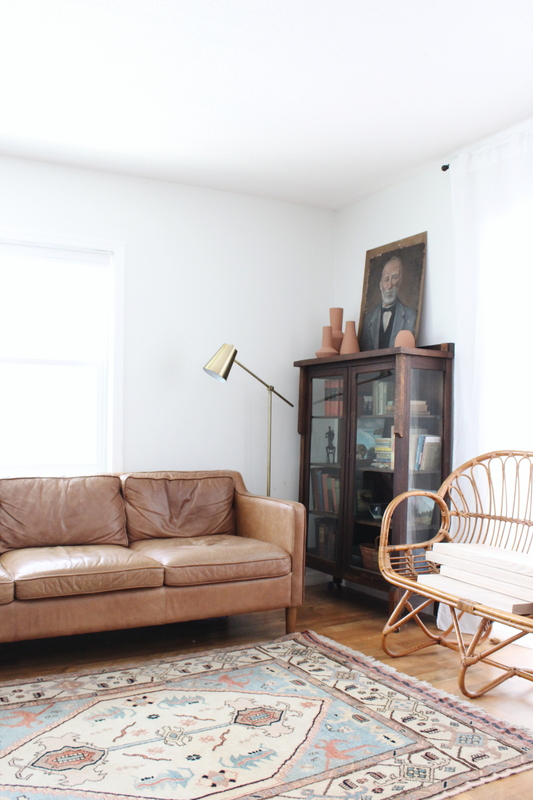 Since early 2017, we purchased a sweet vintage glass cabinet, upgraded to a larger television (my husband’s wish and with my resistance, naturally), and found the best deal on my dream sofa – the leather Hamilton from West Elm. I swapped out the rug (this current one is still too small but it’s what I have to work with) and removed some other furniture to make space for two sofas. We also rearranged the layout and found which arrangement works best. 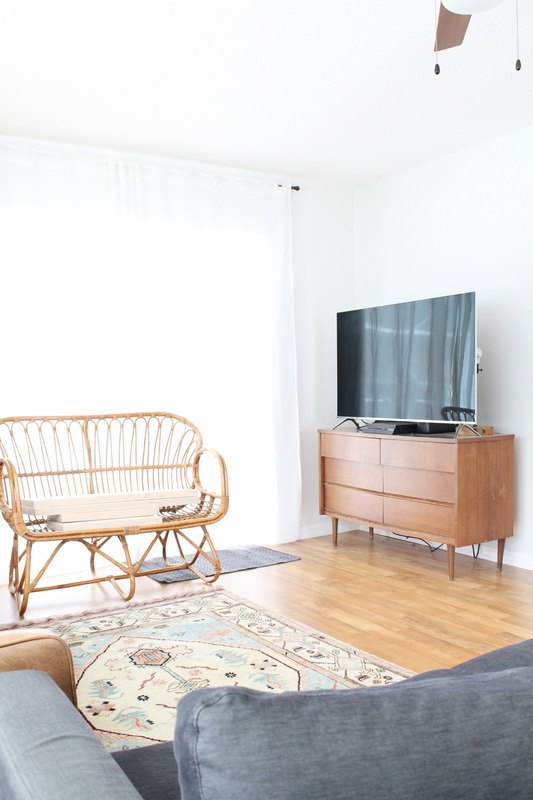 The bamboo loveseat does not have a permanent spot in the house. When these photos were taken it had an important job of holding my kitchen shelves that were waiting to be sealed and installed. 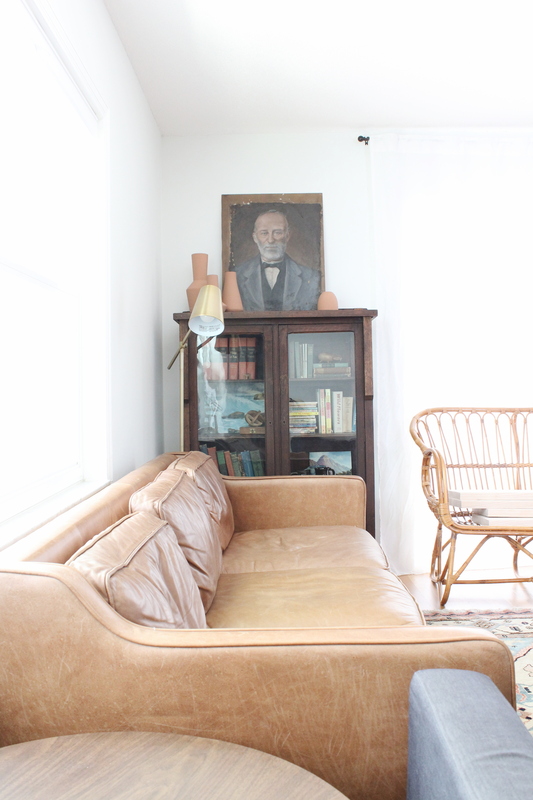 The minute I started working on the shelves, the loveseat was moved to another room. The living room has been a storage ground for our never ending kitchen renovation overflow. Extra cabinet doors, tools that need to remain within arms reach, dishes for our shelves, etc. Initially we wanted to remove this closet that protrudes into the living space between the bathroom and laundry and at the same time remodel those rooms. Instead, we chose to prioritize the kitchen. Now I’m attempting to work around it when every fiber of my being wants to rip it down. Taking deep breaths and trying to remember patience. Now, I’ve had time to ponder some of my short-term goals for this space. I have plenty ideas but not a large budget. 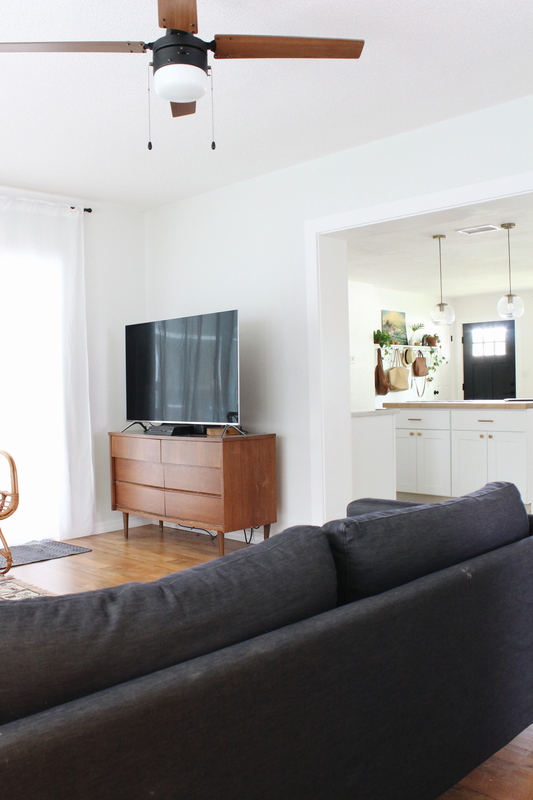 So even though I would love a good set of arm chairs to replace the Karlstad and a large rug that is appropriate for the size of the room, I’m going to give you a run down on what I’d like to do that’s both manageable for my tired body and my small budget. For one, paint. These gray-white walls are too blue (and gray) for my liking. Since these photos (and as you might have seen on Instagram), I’ve already painted over them using Behr’s Polar Bear and the room is already so much better. Also, new trim and baseboard. Again, when these photos were taken, this room had five different types of trim and that needed to change. I did not replace the pocket door trim for the doors leading to the bathroom and laundry room, but I did replace the trim for the windows and sliding glass door along with the baseboard. The most important short-term project for this room is a desk. I purchased the desk material back in July and it sat in our entry way waiting for the right time to install it. The desk was finally installed along the wall where our kitchen overflow was being stored. Once most of those boxes we empty, I set aside some time to build and install our desk. 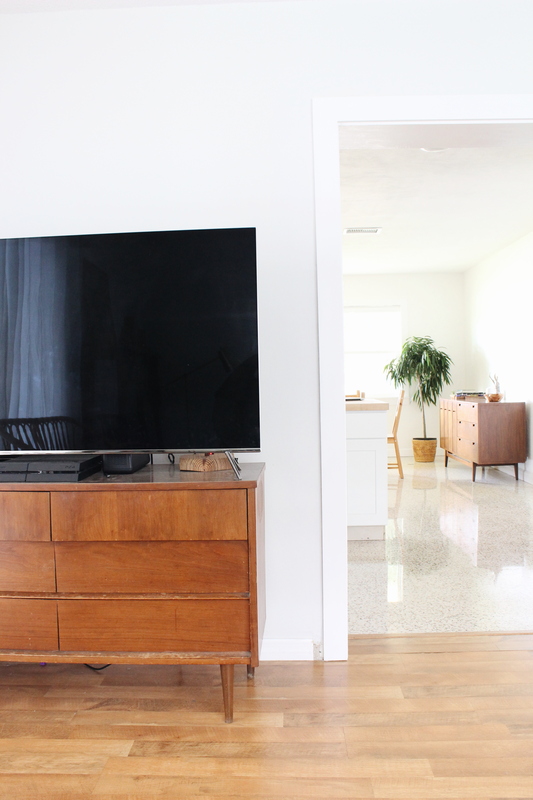 Finally, I also mounted the TV and am feeling super fancy about it. When I first drafted this post, all of the things I just listed were “goals” but those goals were completed the week that I meant to publish this post. Instead of these before photos, I shared my One Room Challenge bathroom photos. So even though these photos and those goals are outdated, I wanted to show you where I started and where I plan to go from here. Accessorize. Lighting, pillows, and artwork. You know, all of the fun things – except on a super tight budget. More seating. We just sold our dark gray Karlstad yesterday. It feels so nice and open but we’re now lacking some serious seating. More importantly, we need desk chairs. I’ll be searching for just the right pair to use for our double desk and in the future will hopefully find some budget arm chairs to replace the second sofa.